Learn how to think strategically and discover how to develop strategic insight, create a strategic vision and define business strategies. This session focuses on developing strategic insight by analysing the internal business and external operating environment in order to create a model of the current state of play. This session focuses on the creation of a 3-5 year strategic vision for your business/team. Specifically, you will develop a future vision and write a vision statement. During this session, you will create a strategic roadmap for your business. This involves identifying key strategic themes and writing long-term strategies for each theme. Thanks Jayne! Bottom line…. I have ABSOLUTELY NO doubt that we will be a better, more effective team because of it. Due to the practical nature of the content, customisation is not necessary. Delegates use their own business for the practical work and can choose whether to focus on the corporate strategy or a more specific strategy e.g., finance strategy, product strategy, team strategy etc. Does it include Strategic Planning? No. 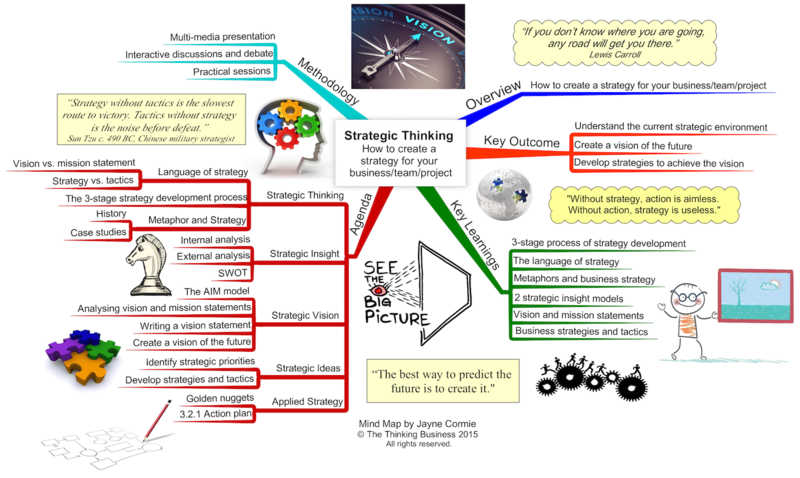 The course focuses on the strategic thinking process and doesn’t cover strategic planning. Jayne has extensive experience in strategic thinking developed throughout her corporate and consulting career. The content is designed to teach junior to mid-level management the essential strategic thinking skills. However, the course can be extended in order to increase the depth and scope of the content required by more senior management.